YES! Nutrition, LLC provides personalized 1:1 Nutrition Counseling to help you say "YES!" and discover ways to living a more nutritious, balanced life. The YES! 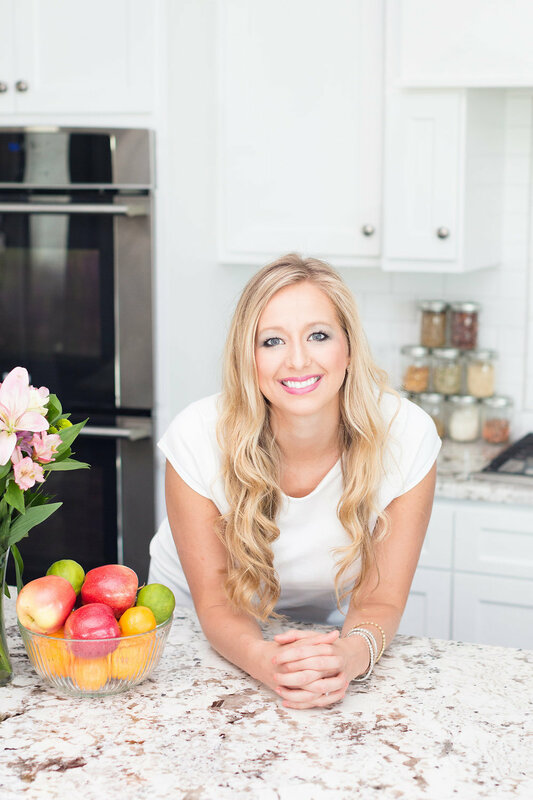 Nutrition blog gives readers answers to common nutrition questions, healthy meal ideas, and inspiration for living a healthier life from an Ohio-based Registered Dietitian Nutritionist. Join in the fun! Want easy meal prep, on-the-go, healthy lunch recipes? Look no further than this ULTIMATE Salad In a Jar! If prepping healthy lunches is a challenge for you, salad in a jar will make your meal prep MUCH easier! In this video, I've partnered with my friends at Foxy Produce to help you learn how to make salad in a jar with your own favorite ingredients PLUS I'm sharing the recipe for the ULTIMATE Salad in a Jar Recipe with strawberries, garbanzo beans, and cauliflower. It's so YUM! First, grab your clean, glass jar. Quart-sized glass jars* work well for making entree salads and pint-sized jars* work well for side salads, fruit salads, or any smaller combination of a mason jar meal. I like using wide mouth jars since they are easier to stuff and easier to pour! Start with your wet ingredients on the bottom, like dressing. Then, layer in your heaviest and non-absorbent ingredients first, like firm vegetables (raw cauliflower, broccoli, etc. ), pulses (beans, lentils, chickpeas). Then, continue to layer with more least-absorbent ingredients (like berries and tomatoes) all the way to the softer ingredients at the top (or just those ones that are more prone to get soggy, like cheese). Special note: if you're planning on storing your salads for more than one day and wanting to use softer proteins on your salad (like hardboiled eggs, tuna, chicken, or fruits subject to browning like avocados) I'd suggest waiting to add these until you're ready to eat the salad. Finally, finish layering by adding your favorite leafy green vegetable and screw on your jar's lid. Store in the refrigerator until you're ready to eat, making sure to keep the jar upright! Simply unscrew the lid when ready to eat and shake into a bowl. You may need to use a fork to help you get out all the delicious goodness! Then, eat! EASY: They're easy to make! Once you have all the ingredients washed, chopped and ready-to-go, layering your salads into the jars can happen in a snap! In fact, it's SO easy even your children can help! READY WHEN YOU ARE: You can store mason jar salads in your fridge until you're ready to eat them. That means that if you'd like to prep a batch of 4 or 5 salads on Sunday night to grab throughout the whole week for lunch at work, you can! PACKED WITH NUTRITION: You can combine your favorite ingredients together. I happen to love the combo of beans, berries and greens, which is why my classic YES! Nutrition salad (featured below) offers all three! You can also strategically think about which nutrients you want to maximize in your salad and add them in accordingly. For example, for healthy carbohydrates in your salad in a jar, add in fruit, whole grains (like quinoa or wheat berries), beans, or corn. For protein in your salad, consider adding beans (yep, these feature both fiber-rich carbs AND plant-based proteins), nuts, seeds, hardboiled eggs, and/or cheeses. And, for healthy fats, consider adding in an olive oil/vinegar dressing, olives, nuts/seeds, or pair your salad with guacamole or avocado on the side. Of course, you can add in all of the vegetables you can fit into your jar, too! Your options are SO limitless! GRAB-AND-GO: Heading out to work? Simply grab a bowl, a fork, and your prepped salad in a jar from the fridge and out the door you go! Or, for the true salad-in-a-jar pros: keep your bowl and fork at work, so you only have to take your jar with you as you leave. HOST A SALAD IN A JAR PARTY: Ask your friends to bring ONE ingredient (one person brings the beans, one person brings the greens, one person brings the dressing, etc.) and ask everyone to bring their own jars. When together, simply set out all of the ingredients on the table and go around the table filling your jars. SWAP WITH A FRIEND: Find a friend who also wants to prepare salad in a jar for busy weeks. Then, separately, each prepare 4 salads. Meet up and swap two of the jars with each other. You'll only prep one version, but you'll get another unique salad combo in return! Yay for variety! COWORKER SALAD SHARE: With a group of co-workers, assign each person to prepare salads for the whole group for a certain day of the week. In other words, you may prepare a salad for each member of group on Monday, but your other coworkers cover the other days. You make lunch once a week (for everyone), then they pay back the favor! Simple! So many delicious combinations can be made with your favorite produce items to create a healthy and totally delicious salad in a jar. Here are some of my favorite salad in a jar recipes. Just remember, layer these ingredients from the bottom of your jar to the top of your jar to keep all your ingredients as firm as you can until you're ready to eat and enjoy! Strawberry Spinach Salad: 2 tablespoons Raspberry Vinaigrette, 1/4 cup broccoli, 1/2 cup strawberries, 1/4 cup gorgonzola crumbles, 2 tablespoons chopped pecans, 2 cups spinach. Blueberry Chickpea Salad: 2 tablespoons of your favorite dressing, 1/3 cup of chickpeas, 1/4 cup of cauliflower florets, 1/4 cup of blueberries, 2 tablespoons of feta cheese, 1 tablespoon of pumpkin seeds, 2 cups of greens. Southwest Salad: 1-2 tablespoons lime juice, 1/3 cup black beans, 1/4 cup corn, 2 tablespoons chopped green pepper, 2 tablespoons pico de gallo, 2 cups of romaine lettuce. Carry a single-serve pack of guacamole on the side to add to the salad when ready. Asian Chop Salad: 2 tablespoons shiitake sesame dressing, 2 tablespoons chopped red pepper, 2 tablespoons chopped yellow pepper, 1/3 cup shelled edamame, 2 tablespoons shredded carrots, 1/2 cup red cabbage, 3/4 cup green cabbage, 2 tablespoons hemp seeds. In a quart sized jar, add the dressing. Then, layer in the chickpeas, cauliflower, and strawberries. Next, layer on top the feta cheese and the hemp seeds. Fill the jar to the top with your favorite leafy green vegetable. Screw the jar's lid on top and store in the refrigerator until ready to eat. Once ready, unscrew the lid and shake the salad into a bowl. You may need to use a fork to help you get all the salad out of the jar! Have you ever made Salad in a Jar? What ingredients did you use? Share your favorite salad in a jar ingredient combos with me below. And, if you try the ULTIMATE Salad In a Jar recipe shared above, let me know that, too! Thank you, Foxy Produce, for sponsoring this food video! Sponsors allow YES! Nutrition to continue to share healthy tips, recipe ideas, and nutritious solutions with all of you. Thank you for your support! *This post includes Amazon Affiliate Links. Hi, I'm Tori, here to share answers to your top nutrition questions and inspire you to reach optimal health! As a Registered Dietitian Nutritionist and founder of YES! Nutrition, LLC, I help you navigate your personal health and wellness challenges and enjoy delicious, real food. I also help food brands help you, too! Have a question of your own? Get in touch! Get FREE the nutrition tips and healthy recipe ideas in YES! Nutrition's monthly newsletter. Thank you for subscribing to YES! Nutrition's monthly newsletter. For continued conversation, please like YES! Nutrition on Facebook, Instagram, and Twitter! © 2014-2019 YES! Nutrition, LLC. All Rights Reserved.